If you are looking for great pergola designs then perhaps Google Sketchup is right up your alley. It’s a 3D design tool that Google offers for free. I’ve found that it is well suited for easily creating 3D models of simple structures like pergolas, fences, arbors, or even more complex structures like gazebos and garden sheds. Google Sketchup sounds more like a condiment than a serious design tool, but don’t let the name fool you! Designing structures and even landscapes with this downloadable program is quick and painless. The toolset is easy to learn and it’s great fun running through your landscapes in free camera mode. This is definitely not a case of you get what you pay for, as Sketchup brings a lot to the table and is available for free! That doesn’t mean that Sketchup is a lightweight design tool though. It has all the features that a beginner needs to begin sketching up new structures and plans for construction in their yard. 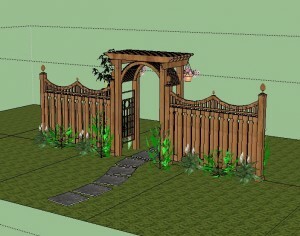 While the precision and accuracy can sometimes be difficult to control, especially on older computers, you can knock up a detailed model of a pergola or gazebo very quickly! One of the great things about Google Sketchup is how you can share your designs with others. This is achieved through the programs access to the online “3D Warehouse”. There are a great many models to choose from in just about any category, just searching for “pergola” or “pergola designs” will return hundreds of results. You can freely download these models and use them in your own landscaping mock ups, or modify them as you see fit. Is it CAD or Not? While Sketchup is a powerful tool, it’s important to note that the freely available version isn’t as full featured as a professional CAD design studio. This is more of a starter edition, suited more to a hobbyist than a professional. If you’re looking for a more robust feature set, Google offers a more powerful version for sale. Still, you can do incredible things with the free version of Sketchup that make it well worth the download.